Huawei’s prominent role in 5G infrastructure could suggest that China is now ready to be a driving force on digital innovation. In addition, the country experienced an unprecedented surge of patent applications over the past years. However, these facts stand in stark contrast with the China’s heavily regulated digital trade environment. What is the real status of China’s innovation performance? Several indicators, including patent applications, suggest that Chinese companies are becoming increasingly innovative. Take Huawei, for example, which accounts for more than half of international patent applications. The company, one of the main suppliers of the 5G network, aims to be perceived as an innovative and forward-thinking brand. Alibaba is another prominent case. Started as a small firm connecting Chinese factories and suppliers, the firm is now the world’s largest online retailer and has expanded far beyond its core business to operate in sectors like cloud computing, digital media and logistics. Admittedly, patents are not a perfect measure of innovation activities. New business models or management structure are not patentable, let alone that China might use them as a defensive instrument against imports. 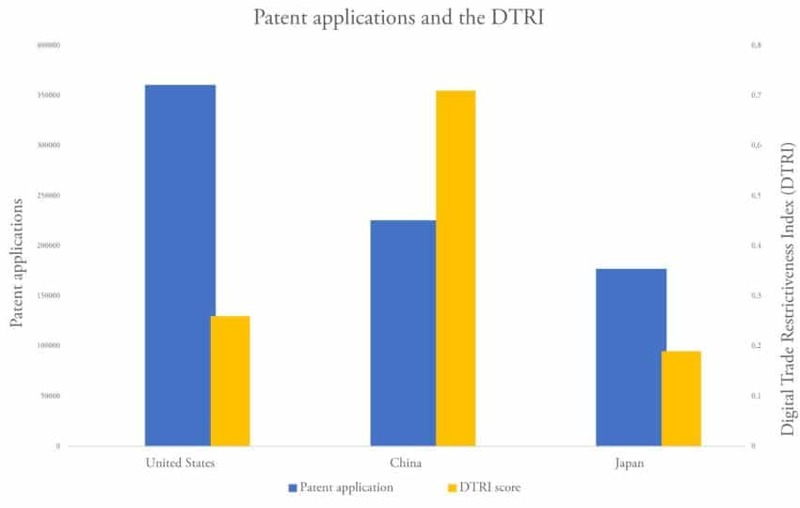 Nevertheless, such a surge in patent applications looks especially remarkable when considering the country’s high level of technology protectionism, with complex regulations governing the Internet and the ICT sector. According to ECIPE’s Digital Trade Restrictiveness Index (DTRI), China has in place the most restrictive measures in all aspects of digital trade, including content access, competition and data policy. Yet, the country possesses a burgeoning digital sector. It is a correlation which bucks the prevailing trend. Low digital restrictiveness tends to increase innovation (see the graph below). In China’s case, the inverse appears to be true. How do we explain this paradox? There appear to be two dominant factors. Firstly, the country’s rapid innovation has arguably benefited from a large domestic market, that allowed digital companies to profit immensely from scale advantages. For instance, China counted more than 800 million internet users in 2018. Most of them live in densely populated cities, which are increasingly attracting scientists, investors and digital entrepreneurs. Second, the government has provided sizeable public investments to encourage digitalization. A report by McKinsey reveals that the government actively supported efforts to integrate cloud computing, big data, and the internet of things with manufacturing and consumer sectors. Over the past few years, consistent public investments have been announced to develop AI applications across several industries and plentiful funding has been granted to several tech start-up incubators. However, China’s innovation performance seems also to be plagued by some weaknesses. In fact, the rapid increase in domestic patent applications is not solely an indication of a rising digital economy. Despite being quantitatively remarkable, the actual novelty of many inventions has been put into question. Generous patent subsidies, originally seen as a policy to foster innovation, appear to have encouraged low quality filings. Companies, in fact, soon started applying for many “junk patents” with no real innovative potential, just to obtain more subsidies. Furthermore, in sharp contrast with domestic figures, the country’s share of patents granted and filed abroad is exiguous – only around 4% of over 1 million patents. Of this figure only 6% of total applications were granted. This would seem to suggest that Chinese patents still struggle to compete quality-wise with international actors. In summation, China’s innovation system seems mostly top-down and deeply rooted in its vast internal market, on which many digital companies rely to perfect and grow their business models. Yet, as both patent data and the DTRI suggest, the country has significant room to improve its innovating strategies. To become a global leader in digital markets, the country would benefit from easing the stringent control over the internet, improve data and e-commerce policies and strengthen intellectual property rights protection. Competing internationally will certainly raise the stakes for Chinese digital companies, but it could also present new opportunities to its entrepreneurs, fully unleashing the country’s digital prowess.